Pet Laundry Detergent uses plant-based surfactants so you can feel safe knowing that you are not exposing your pets to harmful chemical residues or fumes. Eliminates tough odor problems from pet beds and other pet items. This biodegradable product leaves a fresh, clean scent and will not cause irritation to your pet. It is excellent for a wide range of odors. The natural, non-toxic formula is the safe alternative to toxic cleaners, solvents, and bleaches. Our natural formula contains no Volatile Organic Compounds (VOCs). Your pets won't be ingesting toxics when licking the floor or grooming themselves. 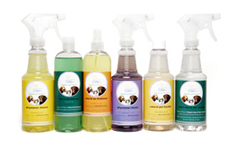 Natural Pet Laundry combines safe cleaning power with the luxurious scent of natural oils. The essential oil of Grapefruit has long been coveted for its fresh, fruity and clean qualities. Natural Pet Laundry is formulated with the safest natural ingredients available and contains no solvents, sulfates, glycols, or phthalates. Ingredients: Natural surfactants, natural spring water, and a natural essential oil blend. Contains no animal by-products.